When I was in middle school, I had a dream in which I was walking around framing things I saw with a little black frame in my mind’s eye. The next day I asked my parents to buy me a camera. Little did I know this would be the beginning of my life’s work. A friend taught me how to process film and make prints in his basement. We’d also go out and photograph together and I seemed to have a knack for it, so I kept doing it. I didn’t take a photography class until the summer before my senior year of college. But I’d been framing and shooting all that time. Even now what I love most about photography is the doing of it. Photography is about looking and really seeing. I look at something and by closing one eye or tilting my head a little bit, the image changes. In painting, you have a blank canvas and you add to it. When you photograph, you have the whole world and your job is to isolate an element of it or eliminate a part of it or to choose a part of it. You’re composing. 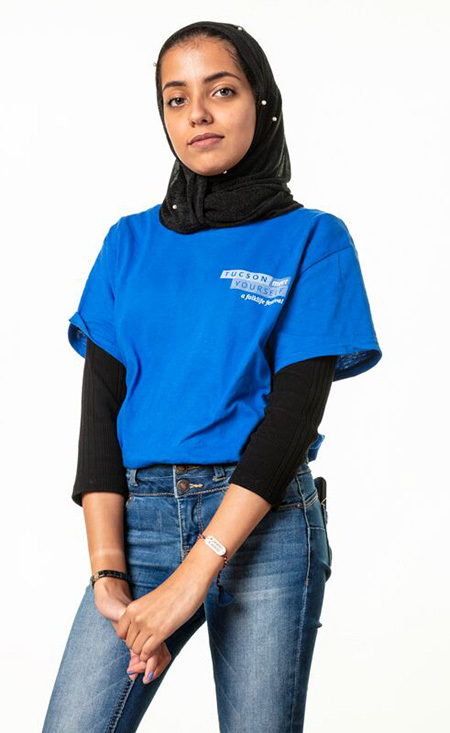 When you combine your esthetic with your technical skill to photograph people of different cultures, you essentially tell a story. In that way, the photographer has some things in common with the folklorist. I create a lot of portraits, both in the studio and on location. A portrait is a document of a moment in time. Creating a successful image requires a combination of appropriate composition, good lighting, and the right moment. The more you know about or understand your subject, the easier it is to bring those elements together to say something essential about your subject. 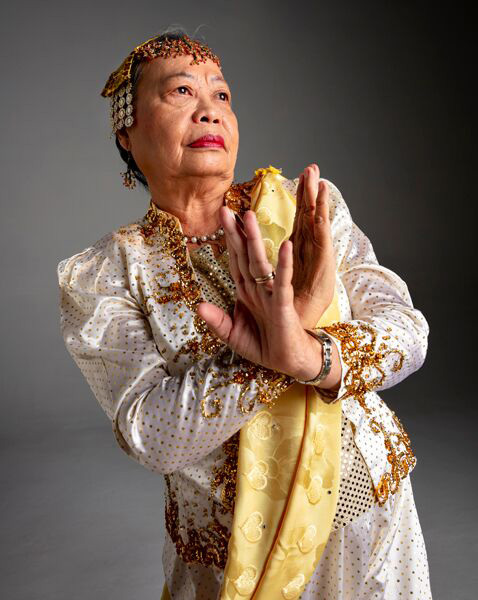 Neneng Babanto Fassler, 2018 SFA Master-Apprentice Artist Awardee, performer and teacher of Philippine regional folk dances. You have to care about your subject. You could be a great photographer with all the technique in the world, but if you don’t care about your subject your photos will reflect that and come up short. What I’ve learned over the years is that to make a successful portrait, I need to get as much info from the person I’m photographing as I can. I often interview people first, even for just two or three minutes, to learn something about them, to know something of their story. The more I know, the more I can infuse into the image. Sometimes I ask people to bring an object or a simple prop. Or we choose a location that is significant to them or has interesting visual elements. 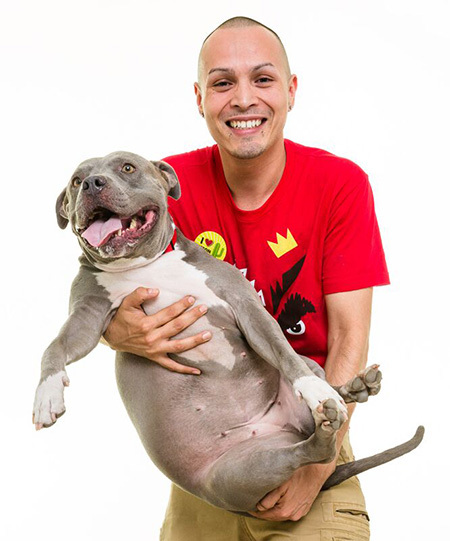 Hugo with Mosa, from Faces of the Festival 2017. Many years ago, I did a project about interesting professions. I called the head priest at San Xavier Mission, but before he let me photograph him, he wanted to meet me. He shared later that he had met some rude photographers in the past and wanted to vet me as a person. We met and talked about my work. That was about creating a relationship. He did to me what I usually do first. But I loved that. It helped me and it helped him. I start observing people the minute I meet them. Before a studio portrait session, I leave a few things undone. This is because people are always rushing in from somewhere else. They’re almost always out of breath. I let them acclimate while I get the last things ready. But I look at them while they’re waiting. People stand a certain way. They sit a certain way. I’ll observe that. “Stand like that in front of the camera,” I’ll say. The idea is to bring out what feels natural to them. Jeanine, from Faces of the Festival 2017. Photographing events like Tucson Meet Yourself (TMY) is, for me, an opportunity to “find” photos. That happens when all the technical elements come together with the right moment. Photographing this way can bring incredible surprises. 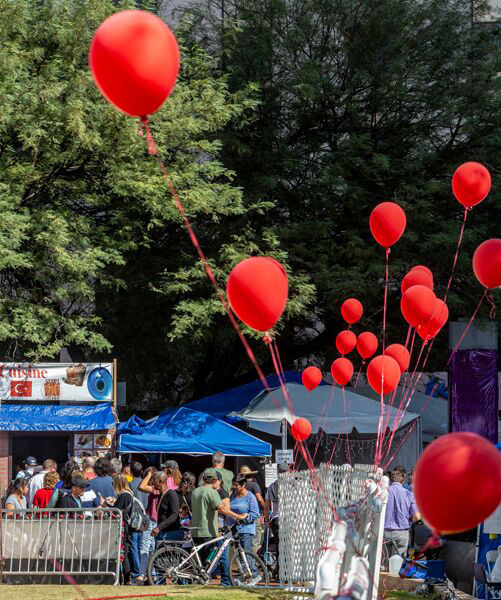 When I photograph the TMY annual folklife festival, I meander around the event, looking and letting things come to me. I’m moving around, paying attention, and evaluating. I turn my head a little. I tilt. I move closer or farther away. I adjust my focus. I shift my depth of field on the camera. All of this is happening at once. But you can never see everything all at once. Filipina performers at Tucson Meet Yourself. Once, I went backstage where the Yaqui performers were preparing for the ceremonial dance that closes the festival every year. I saw men dressing their young sons before the dance. I knew exactly what the message was—the passing down of tradition to the next generation—and that the clearest place to communicate that was right there, back stage. I also knew that because the Yaqui deer dance is ceremonial, photographs were prohibited. But I was so floored by what I was seeing that I asked one of the leaders if I could photograph not onstage, but back stage. When he said, “Go ahead,” I jumped at the chance. 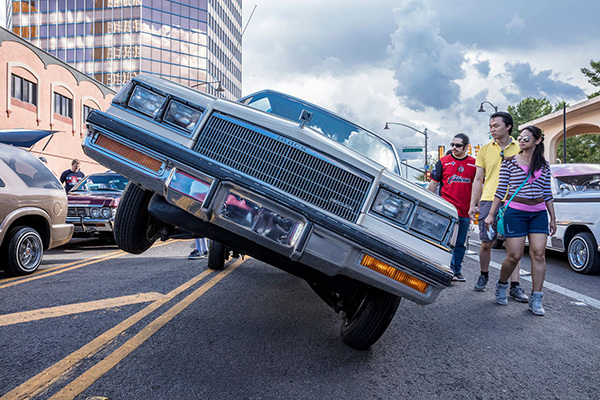 Of course, Yaqui ceremonial dancing represents a significant cultural moment, but it’s one that you or I may or may not connect with. Fathers helping sons put on the traditional outfit, however, is something I and many people could immediately understand. It was that interaction between the father and the son that told the story. It was such a simple, primal, basic message that I almost shook worrying I wouldn’t capture it. But I shot 100 or more photos there. And got it. 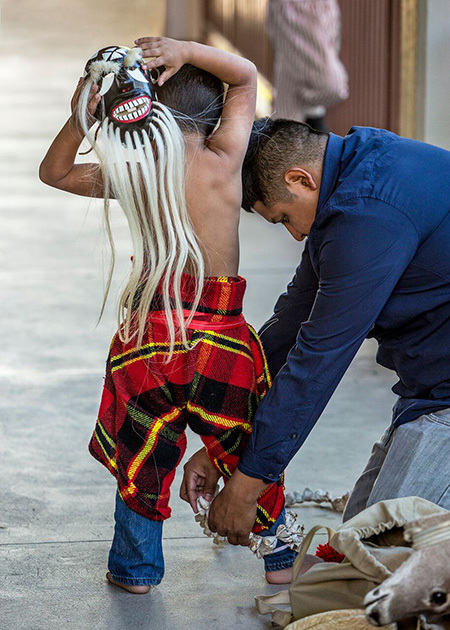 Father helping son put on traditional outfit for Yaqui ceremonial dance demonstration at Tucson Meet Yourself. It should be self-evident that coming with a basic understanding and respect for someone else’s culture and norms is essential in this work. I kept a respectful distance and asked permission for the photo because I can only tell someone else’s story with their approval. 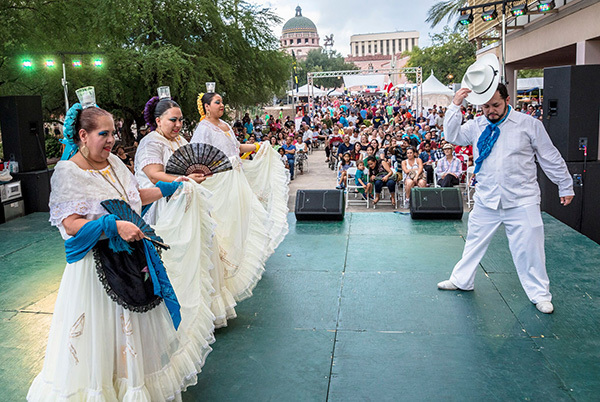 Ballet Folklorico La Paloma at Tucson Meet Yourself. 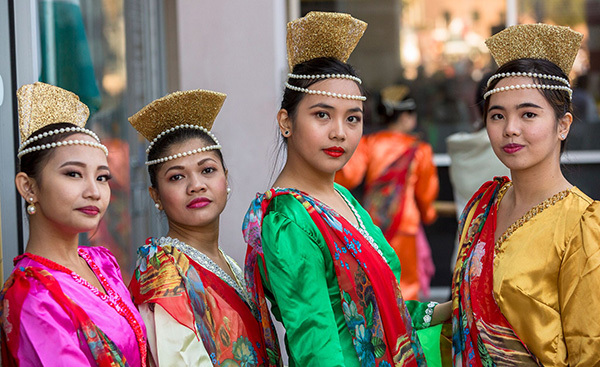 Anyone who documents another culture—or his or her own—documents folklife. In some ways everything I do is documenting folklife. I was recently hired to photograph candidates in Phoenix for their campaigns for city council. Campaigns are themselves a cultural tradition and the images are folklife documents. I created photographs of the politicians with veterans, senior citizens, and families. They are a record of values and traditions in time and place. 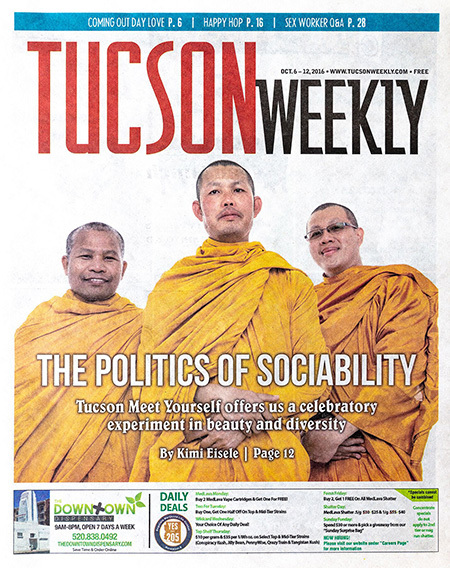 Tucson Weekly cover for 2016 Tucson Meet Yourself. 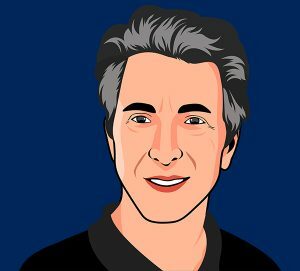 Every day some 350 million photos are loaded onto Facebook. That’s more than were created in the whole of the 18th century. That’s a lot of imagery to contend with. That imagery is a part of our culture and now folklorists study how it affects people. 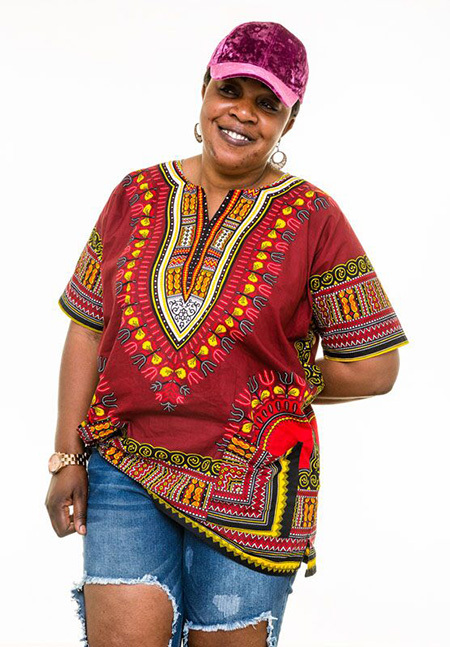 Dina, for Faces of the Festival, 2018. But a photo is not reality. A photo is at best a reflection of a moment in time. Just as a folklorist might assess a single person or a single custom, a photograph offers a limited glimpse at a subject. It can offer clues about the whole, but it is not the whole. 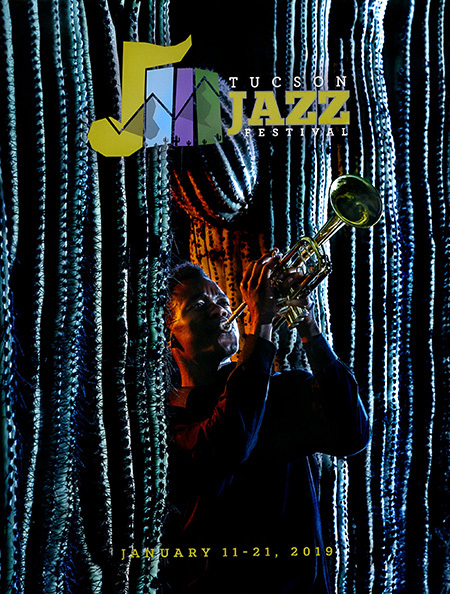 That’s why I find it important to go back to TMY again and again to fill in more context and depth in our incredibly diverse Tucson folklife.